Although investigated for over 100 years, it is only now that we are beginning to understand how speed of information processing is affected in various clinical populations. Processing speed has a major impact on higher level cognitive abilities and is extremely vulnerable to neurological insult and the aging process. The importance of processing speed with respect to brain function, cognition and overall quality of life is now the focus of a new and exciting body of research in clinical populations. This book provides a scholarly and clinically sensitive review of research on processing speed and its issues in clinical populations. Readers will come away with an in-depth understanding of human information processing speed including its historical development, its relationship to other cognitive functions, the developmental course of the ability across the lifespan, and its impact on everyday life in various clinical populations. Other highlights of the text are its discussion of the speed vs. accuracy trade-off, tools available for measuring processing speed, the unfolding research on genetic contributions to processing speed, and the latest ideas in rehabilitation. 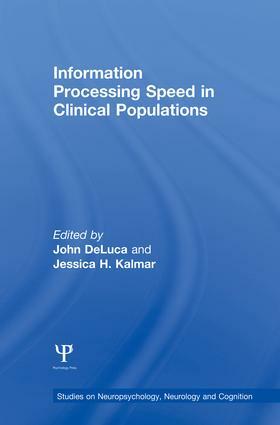 With contributing authors who are experts in their fields, Information Processing Speed in Clinical Populations represents a valuable resource for researchers, scholars, and clinicians by providing a concise summary of the existing research on processing speed across an array of disciplines and populations. A.R. O’Brien, D.S. Tulsky, The History of Processing Speed and Relationship to Intelligence. T.A. Martin, S.S. Bush, Assessment Tools and Research Methods for Human Information Processing Speed. H.A. Demaree, T.W. Frazier, C.E. Johnson, Information Processing Speed: Measurement Issues and its Relationships with Other Neuropsychological Constructs. D. Posthuma, E. de Gues, The Genetics of Information Processing Speed in Humans. R.V. Kail, Speed of Processing in Childhood and Adolescence: Nature, Consequences, and Implications for Understanding Atypical Development. D. Dickinson, J.M. Gold, Processing Speed and the Digit Symbol Substitution Test in Schizophrenia. J.H. Kalmar, N.D. Chiaravalloti, Multiple Sclerosis. G.J. Kinsella, Traumatic Brain Injury and Processing Speed. R.K. Mahurin, Frontal-subcortical Determinants of Processing Speed in Parkinson’s Disease. T.A. Salthouse, D.J. Madden, Information Processing Speed and Aging. K. Ball, D.E. Vance, Everyday Life Applications and Rehabilitation of Processing Speed Deficits: Aging as a Model for Clinical Populations. J. DeLuca, Information Processing Speed: How Fast, How Slow and How Come? John DeLuca, Ph.D., ABPP, is the Director of Neuroscience Research and Vice-President for Research Training at the Kessler Medical Rehabilitation Research and Education Center (KMRREC), and Professor in the Department of Physical Medicine and Rehabilitation and the Department of Neurology and Neuroscience at the University of Medicine and Dentistry of New Jersey, USA. He studies disorders of memory and information processing in a variety of clinical populations. Dr. DeLuca has published over 300 articles, abstracts and chapters in these areas. Jessica Kalmar, Ph.D., is a neuropsychologist conducting research within the Mood Disorders Research Program, Department of Psychiatry at the Yale University School of Medicine, USA. Currently, Dr. Kalmar studies neural circuitry and cognition in various adolescent psychiatric populations including: bipolar disorder, attention-deficit/hyperactivity disorder and major depressive disorder. Additionally, she has studied information processing in neurological populations, including individuals with multiple sclerosis and traumatic brain injury. Dr. Kalmar has published articles, abstracts and chapters in these areas.